Big questions for human kind. Is the reality we experience all in the mind, which interprets the so called real physical world that is separate from us? Does the brain generate consciousness or detect consciousness? The reductionists among us would say generate. I say it’s both with consciousness as a continuum of energy flooding the universe. I believe that the brain acts as an antenna to tune in to this hyper-dimensional sea of energy. An analogy could be how radio waves permeate the electromagnetic spectrum. Physicists may call this a sea of vibrating strings. Jung called it the collective unconscious. Ok so are the psychedelic states, along with all the visions of, fractal landscapes, beings and spectacular light shows, simply the workings of the brain; simple manifestations of neural processes? Or do these visions actually exist in other dimensions that permeate or sit alongside our own? 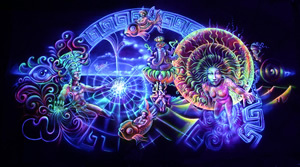 If you’ve ever had a full on Ayahuasca experience, then it can seem that these visions are indeed real and do exist somewhere. The truth is no one really knows – it is impossible to meet someone in that place and stand around and chat about it objectively, while flying around a great jaguar headed being which is captaining a flotilla of sailing ships in the sky. It’s a personal experience that can only be shared verbally in our boring old 4D world. Sigh. Personally I believe that there are other dimensions that permeate or live alongside our own, that we get to experience in altered states. I don’t think that the beings are real – the reptilian creatures, the aliens, the giant toucan headed human or Jesus floating above in a cloud. If a Catholic priest touches these worlds he may visit Jesus in the sky, or may be tormented by the devil looking like a goat. A Jew may see Ezekiel in a chariot or Beelzebub swallowing him up. An atheist may see a magnificent hyperreal landscape with mystical beings and ships in the sky or a demon as an insectoid alien. A South American shaman may see the jaguar and the snake. The mind is working to make sense of what is happening. It is trying to save itself from a serotonin storm and it’s looking for congruence.